No Mississippi athlete has been more revered than University of Mississippi quarterback Archie Manning. During the late 1960s and early 1970s, the state caught what one sportswriter labeled “Archie Fever.” “The Ballad of Archie Who” immortalized Manning in song, while water towers screamed Manning’s name across the state’s landscape. James O. Eastland, a US senator from Mississippi from 1943 to 1978, claimed that Manning “has done more good for the state on the national scene than any man of the generation.” At a time when the Magnolia State conjured up images of racism, poverty, and backwardness in the minds of many Americans, Manning’s football career provided a symbol of success. One Mississippian even said, “When outsiders pointed to James Meredith, the Philadelphia murders, the Ku Klux Klan—everything that was wrong with the Deep South in the 1960s—there was always an answer: Yeah, but we’ve got Archie Manning.” State politicians and journalists referred to Manning as the ideal all-American youth, a patriotic, humble young man who was the antithesis of the young radicals found across college campuses in the 1960s. Born on 19 May 1949, Elisha Archibald Manning III grew up in Drew, a small town in the Delta. He led a busy childhood, participating in church-related activities and numerous sports. Manning starred for Drew High School in football, basketball, and baseball and was valedictorian of his graduating class. He attended the University of Mississippi, and after spending his freshman year on the school’s junior varsity squad, Manning led the Rebels to a 7–3–1 record during the 1968 season, capping the year with a Liberty Bowl win over Virginia Tech. Over his junior season, Manning posted some remarkable statistics—1,762 passing yards, 502 rushing yards, and 23 total touchdowns—as the team notched an 8–3 record. On 1 January 1970 the Rebels defeated Arkansas in the Sugar Bowl, 27–22. In addition to earning the game’s Most Valuable Player award, Manning took home the Southeastern Conference’s Offensive Player of the Year award, the Walter Camp Memorial Award for the outstanding back in college football, and a spot on the all-American team. He also finished fourth in the Heisman Trophy balloting. Manning and the Rebels had a strong start to the 1970 season, defeating their first four opponents by an average of nearly 20 points. After a surprise defeat by in-state rival Southern Mississippi, however, the team suffered two more losses and Manning broke his left arm. Hampered by the injury, Manning kept the Rebels close in the Gator Bowl, but the Rebels lost 35–28 to Auburn. 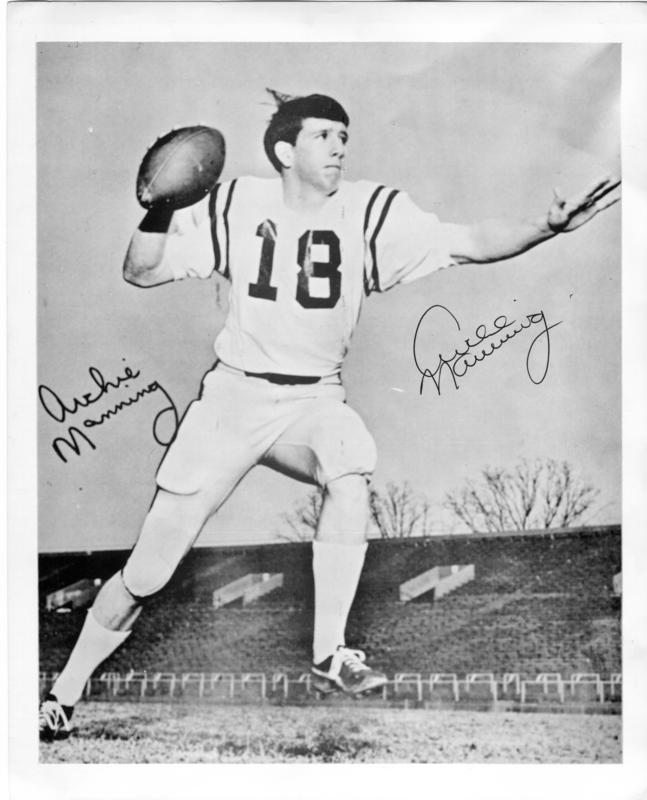 Manning finished third in the 1970 Heisman Trophy vote and ended his college career with a litany of school records. In the spring of 1971, the New Orleans Saints selected Manning with the second overall pick in the National Football League draft. Manning remained in the league for fourteen seasons, playing for the Saints (1971–81) as well as the Houston Oilers (1982–83), and Minnesota Vikings (1983–84). Playing for some of the league’s worst teams, Manning never appeared in the playoffs and sustained numerous injuries. Nevertheless, he was selected to the Pro Bowl in 1978 and 1979 and was named the National Football Conference’s Player of the Year in 1978. In 1989 he was inducted into the College Football Hall of Fame. He has worked as a football broadcaster and in 2013 became one of the inaugural members of the College Football Playoff Selection Committee, though he resigned for health reasons the following year. Participants in a 1999 Jackson Clarion–Ledger poll overwhelmingly chose Manning as Mississippi’s Athlete of the Century, giving him nearly three times as many votes as the second-place finisher, Hall of Fame running back Walter Payton. Manning remains a popular figure in New Orleans, where he still makes his home, and across the Gulf South, though many younger football fans may know him best as the father of Super Bowl–winning quarterbacks Peyton and Eli Manning.